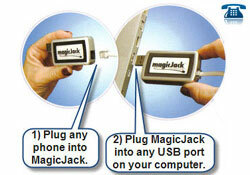 MagicJack is a small size plug-and-play USB telephony device. It offers unlimited local and long distance calling within the U.S. and Canada. It costs $39.95 for the first year including a years subscription and $20/year thereafter. there is also 30 days trial option for pepole who wants to test it. HOMEMADE SOUPS are highly nutritious and wonderfully versatile. They may be simple and quick to prepare or cooked gently and slowly to extract maximum flavor from the ingredients. They may be hot and warming or cold and refreshing, light and delicate or rich and hearty. There are even sweet and fruity soups. First-course soups should stimulate the appetite and not be too filling. 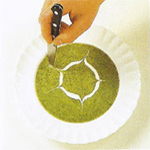 Pureed vegetable soups are ideal as first courses, as are clear soups, particularly those with attractive garnishes. Main-course soups are designed to be sustaining, and they normally contain ingredients such as meat, poultry, fish, legumes, and pasta. Some good bread is usually the only accompaniment they need to make a well-balanced meal. Fruit soups, which are often served chilled, can double as delicious desserts. A well-flavored stock forms the base of many soups, and nothing tastes as good as homemade stock. Stock is economical to make because it is based on meat or fish bones, trimmings, and vegetables. I Although it takes time to make stock - several hours of gentle simmering - it is easy to prepare and can be made well in advance and in large quantities. It can then be frozen until needed. Recipes for stocks can be found on pages 104, 148, 209, and 276. If you don't have any homemade stock, you can substitute stock made from bouillon cubes or powder instead. Remember that bouillon cubes are often strong and salty, and some contain artificial colorings and flavorings. 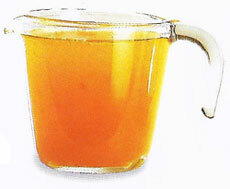 Another quick alternative is to use canned broth or consomme, now available in reduced-sodium varieties. For many soups, a microwave oven cannot give the same results as long, slow cooking, but it can produce light vegetable soups in minutes and is useful for thawing frozen stocks and soups and for reheating soups. The most efficitnt way is to transfer the soup to individual bowls because heating soup in larger containers takes longer in a microwave than in a pan on the stove. For cooking, use a container that is large enough to allow the soup to rise up slightly during heating. Stir the soup once or twice during cooking, especially just before serving, because microwaving creates "hot spots" in liquids that must be stirred in to equalize temperature throughout. Add any garnish just before serving. Soups taste best if freshly made, but most can be frozen without impairing flavor or texture. Avoid freezing soups containing ingredients such as pasta, potatoes, and rice since they become mushy. It is always best to underseason, because extra seasoning can be added when reheating. Add any cream, eggs, and milk at the reheating stage; freezing could cause separation or curdling. To thaw a soup to be served hot, heat from frozen in a heavy saucepan over low heat, stirring occasionally. If the soup appears to be separating, whisk briskly until smooth or work in a blender or food processor for a few seconds. Thaw soup to be served cold in its freezer container in the refrigerator. Many smooth soups reach a slightly thickened consistency simply by being pureed. 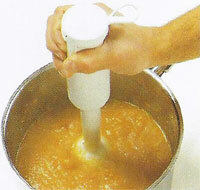 Pureed soups containing starchy ingredients such as rice and potatoes will be even thicker. In some recipes, a little flour is added to the softened vegetables to bind the fat and juices together before pureeing. 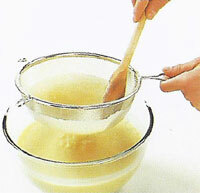 Soups that are not pureed may also be thickened - ith the addition of a little flour before the stock is stirred in. A classic thickening method is to start . 'itha butter and flour mixture called a roux, just you do when making a bechamel sauce. Fresh herbs, either chopped or as whole leaves, are idely used to garnish soups - mint, chives, thyme, parsley, basil, tarragon, and cilantro are all popular. Choose an herb that complements or mirrors any herbs in the soup and add it at the last minute so that it retains its freshness. Other garnishes include grated or crumbled cheese, chopped hard-boiled egg, crisp pieces of bacon, shredded or diced meat or poultry, toasted nuts, croutons, chopped scallions, and sliced or diced cucumber. A spoonful of a sauce such as pesto adds contrast in color and flavor. 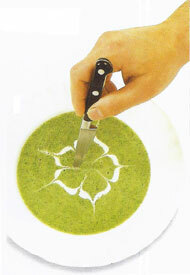 Or create a pattern on the surface of a smooth soup, using heavy cream for hot or cold soups. Plain yogurt can be ed instead of cream for cold soups. 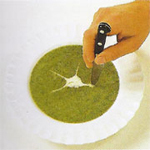 Many attractive garnishes can be added to a soup just before serving. Cream adds a decorative and enriching touch. Whipped cream or sour cream can be simply spooned into the center of a soup, or you can try your hand at one of these simple patterns. Star Put a spoonful of cream in me center. Draw the tip of a knife from the center oward the edge of the up to make 5 points. Ring of hearts Drip cream from the tip of a teaspoon to form a circle of drops. Draw the tip of a small knife through the center of each drop. 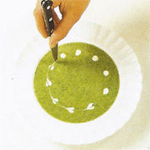 Flower Drizzle cream from the tip of a teaspoon to make a circle. Draw the tip of a knife through it outward, then inward. Soups are often pureed to give a velvety texture. Starchy vegetables or flour helps thicken them. Blender or food processor Either of these can be used to process the cooked ingredients in batches. Scrape the sides to ensure there are no solid pieces left unprocessed. 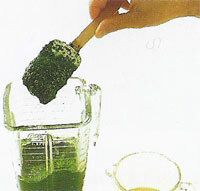 Hand blender Use this to puree directly in the saucepan, but only for small quantities of soup. It is ideal for blending in a final addition of cream. Strainer Work soup through a fine strainer with a wooden spoon. If soup has been pureed in a blender, it can then be strained to make it smoother or to remove any fibers, seeds, or skins. As a soup is brought to the boil, foam or scum may form on the surface. This is most likely with soups that contain meat or poultry, particularly on the bone, or root vegetables and legumes. This foam, which contains impurities, should be removed as it forms. Use a large metal spoon or skimmer (slotted if there are herbs and whole spices in the soup) to skim off foam. If there is a lot of fat on the surface ofa soup, skim it off with a large metal spoon or blot it with paper towels before serving. Heavy cream and creme fraiche can be added to a hot soup and cooked longer, without danger of curdling. Light cream, sour cream, and yogurt will curdle if overheated, so add them just before serving and warm through over low heat. For chilled soups, add cream or yogurt once the soup has been chilled, before serving.